Ever since I was a kid, OREO Cookies have been my absolute favorite snack. Now, Jack has developed my passion for the dark chocolate wafer and smooth delicious cream filling. Many nights have found the two of us planted on the couch enjoying a couple OREOs and a glass of ice cold milk. Back in school, my Mom’s OREO Delight was the special reward for an all A report card and other worthy celebrations. 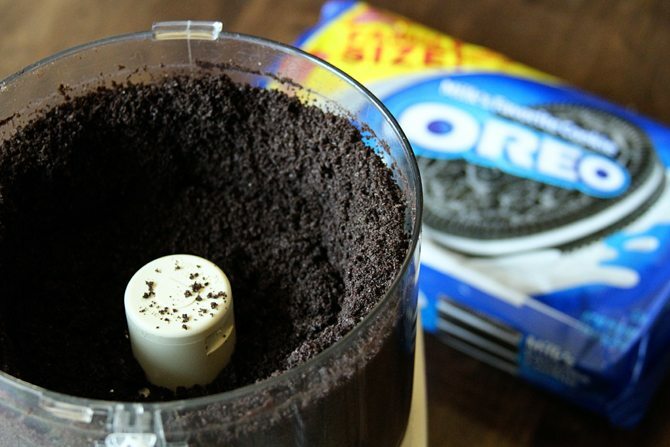 To start, you’ll need to get those OREOs crushed nice a fine. I find that that easiest way to do that is in the food processor. Next, combine the softened cream cheese and the cookie crumbs in a large bowl. I’m not going to lie, this takes some time. Just be vigilant and keep stirring. It will all come together. I found that using the back of a spoonula to press the mixture together helped a lot. Now, roll the dough into 1 inch balls. I used a small cookie scoop to scoop out the dough and keep them all portioned about the same. 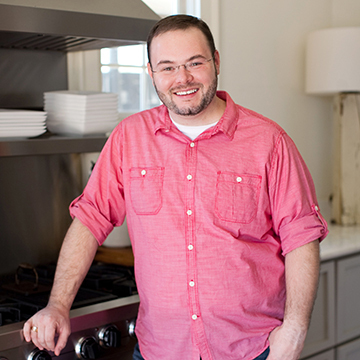 Place the balls on a wax paper-lined baking sheet or jelly roll pan and freeze them for about 10 minutes. 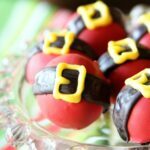 To coat these, I used Wilton’s Candy Melts. It’s super easy to work with and hardens quicker that almond bark. 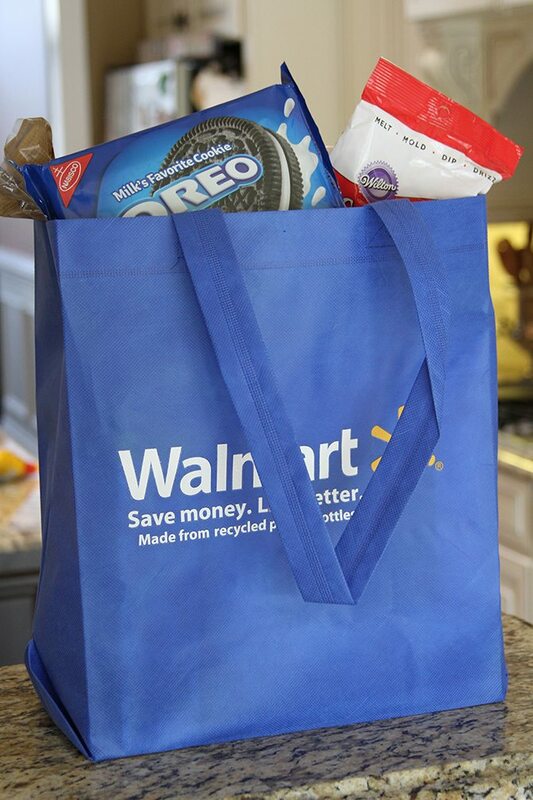 The best part is you can get both the OREOs (insert Walmart landing page when link available) and the Wilton Candy Melts at Walmart, so there’s no need to have to run all over town to get various ingredients. To make the Santa decorations, melt about 1/2 of the package of black Candy Melts according to the package directions. Pour the melted chocolate into a disposable piping bag or a zip top back and carefully snip off a small part of one corner. Use the bag to pipe a wide belt across the cookie ball. Allow it to harden. Next, melt about 1/4 of the package of yellow Candy Melts according to the package directions. Pour the melted chocolate into another disposable piping back or a zip top bag and carefully snip off a small part of one corner. Use the yellow to carefully draw the buckle on the belt. Allow to harden. Store in the refrigerator. If you decide that you don’t want to go the Santa decoration route, you can coat them in white or regular chocolate and sprinkle a few cookie crumbs on top for decoration. 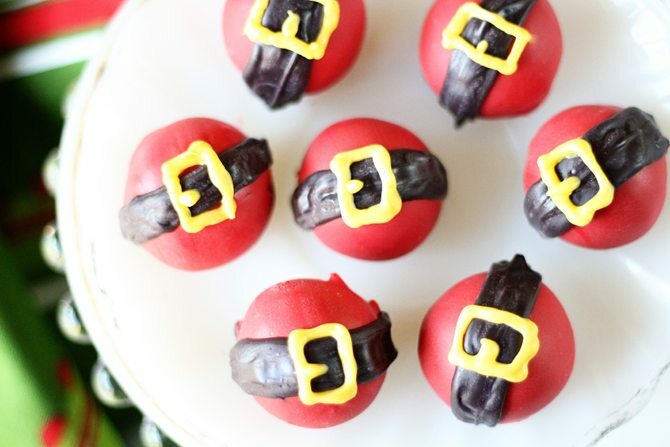 Regardless of how you decorate them, you and your family are going to love them. 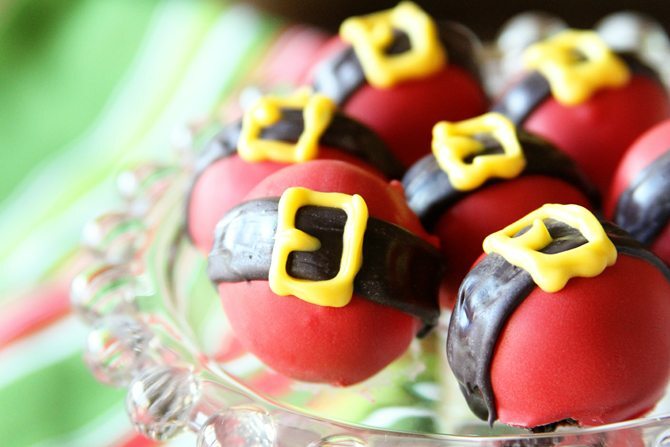 They’re the perfect thing to add to your holiday spread! 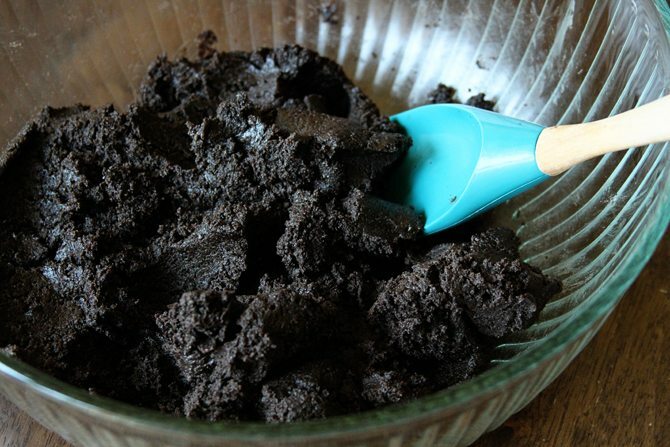 In a large bowl, combine the cookie crumbs and the cream cheese. Mix until a thick dough forms</g> and all the cream cheese has been incorporated. Next, roll the dough into 48 (1-inch) balls and place them on a wax paper-lined baking sheet. Freeze for 10 minutes. Following the directions on the package, melt the red Candy Melts in the microwave. 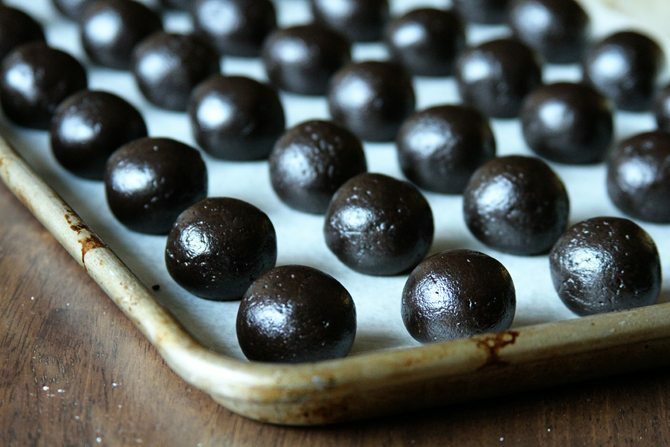 Carefully coat each of the balls in the melted chocolate and place them back on the wax paper-lined baking sheet. Allow the coating to harden. 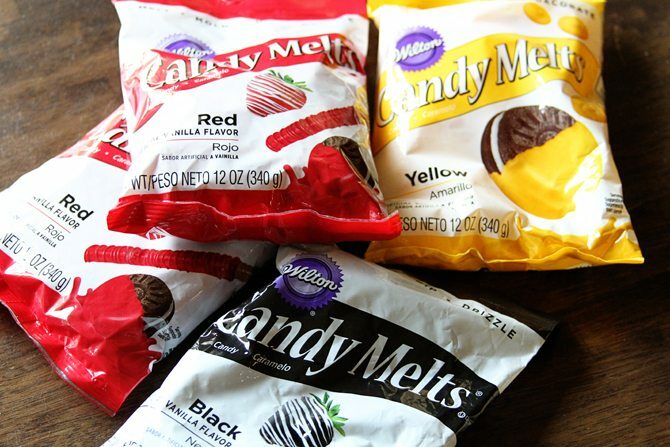 To make the Santa decorations, melt about 1/2 of the package of black Candy Melts according to the package directions. Pour the melted chocolate into a disposable piping back or a zip top bag and carefully snip off a small part of one corner. Use the bag to pipe a wide belt across the cookie ball. Allow it to harden. Next, melt about 1/4 of the package of yellow Candy Melts according to the package directions. Pour the melted chocolate into another disposable piping bag or a zip top back and carefully snip off a small part of one corner. Use the yellow to carefully draw the buckle on the belt. Allow to harden. Store in the refrigerator. Your Santa Bellies are super cute. Fess up though Stacy-a couple Oreos with milk. I can eat a couple while I am opening the package. Do you use regular or double-stuffed Oreos? About how many does this make? What is the measurement on your scoop – how many tablespoons? Thanks. 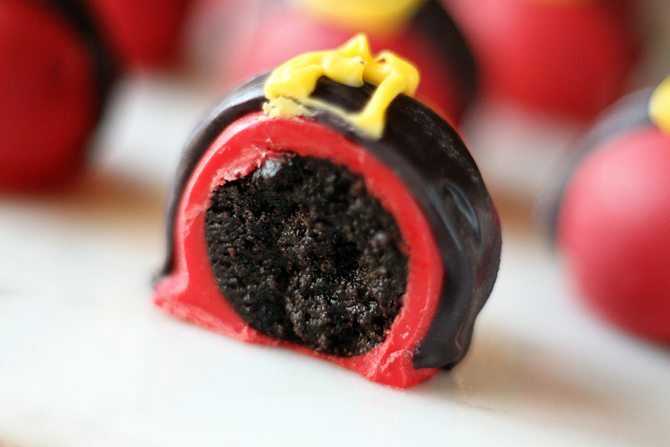 I’m going to try to make these. You use regular Oreos. It makes about 48 balls. It’s a #60 scoop, which is about 1 tablespoon. 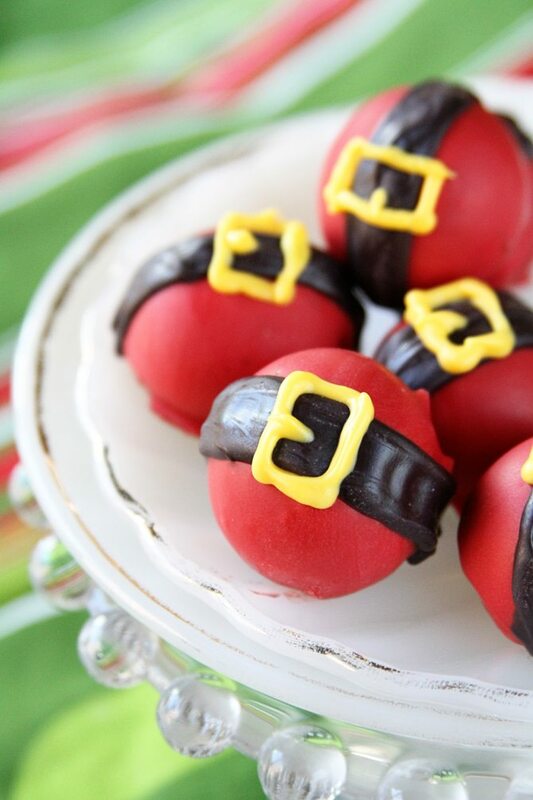 These look absolutely delicious and are adorable!!! 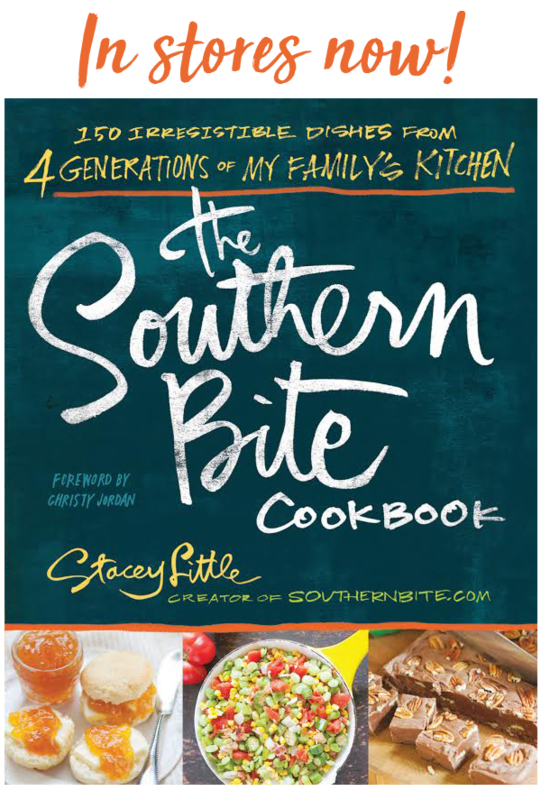 Love your blog…so many great recipes! Do you crush the Oreos including the cream middle part of the Oreo or just the cookie part? Crush them with the creme. I’ve had these before so I’m making them for our Relay for Life cookie exchange at school Monday.